A brief look at my Hurricane Sandy coverage today. Been out in it most of the day, but due to a lack of power and internet connectivity, not to mention the ability to keep my Mac, mobiles and other devices thoroughly charged while tethered to a car charger, this is the only image I’m getting around to posting tonight while working by candlelight from here at home. Stay tuned… ~cg. 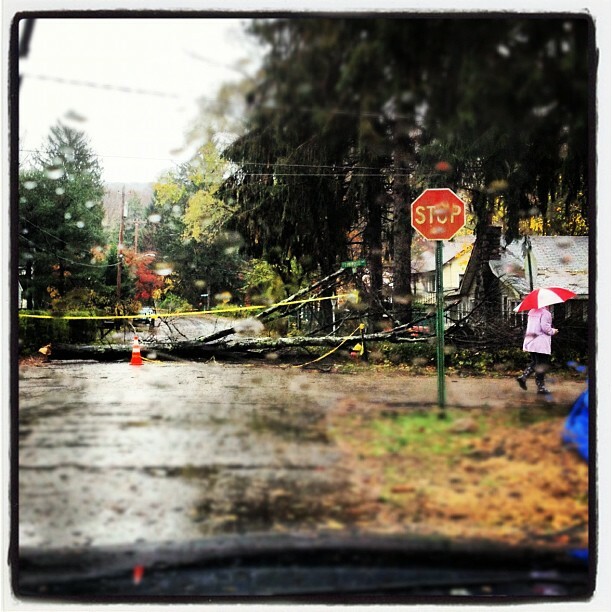 A pedestrian walks past a downed tree on Fernwood Ave. in Greenwood Lake, NY, on Tuesday, October 30, 2012. Hurricane Sandy struck the East Coast in New Jersey last evening, causing power outages to thousands in the tri-state area, and causing 15 deaths in NY State. This entry was posted on Wednesday, October 31st, 2012 at 1:57 AM. It is filed under Assignments: and tagged with hurricane, sandy. You can follow any responses to this entry through the RSS 2.0 feed.